Sign up to keep track of Elloa's updates or create your own profile to share your gaming experience, follow your favorite games and show off your gaming identities. Elloa is now following Harmony. We are very grateful in his participation. it was very fun to record. I really enjoyed this special episode :) !! Since the earliest days The Elder Scrolls Online had been my favorite game. It has evolved so much along the years! It is now, a wonderful game to play alone, in duo, with a few friends or with large groups. The game is flexible, and allow players to play together regardless of their level and factions. There is many activities to do, and for a guild so many possibilities to organise fun events! In June, the first expansion will be released, with a new areas to explore, new quest, battlegrounds, and a new trial! So much content to try out and to play! For the three years anniversary of Whitestar-ESO, I've decided to invest more time and energy to restore and create a wonderful guild for all our members to enjoy themselves in Tamriel! I'll do this together with @PhunkeyMonkeh Not only we will organise many events of all kind, and encouraging everyone to join, but we will slowly restructurate the guild and give it a bit more of organisation so we can expand it in a truely active guild. We are also preparing a big surprise for Whitestar, that I hope will be source of much enjoyement for everyone! Some of those events will allow flexibility and some will requiere a defined team. 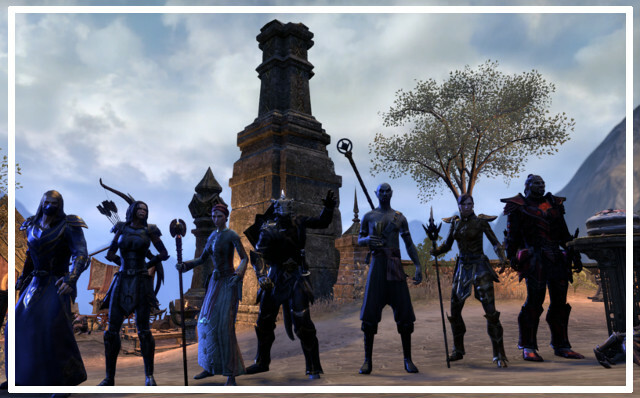 I hope this will encourage old players and new players alike to return in The Elder Scrolls Online and join us for wonderful adventures in Tamriel.If you have any questions, or suggestions, please feel free to let us know. I don't do heroic raids so sunday is the likely evening for me to run it and it will be entirely drop in event. Elloa added a new picture to album Adventures in Eorzea! Elloa is now following MMO-BIBLE and PepperOnionSoup. I got an invite for dinner tonight, so I may be joining late, Overwatch crew. Feel free to start without me!